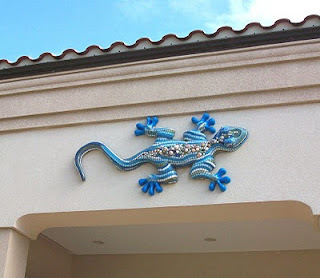 I mosaicked this gecko as part of the 2010 Geckofest for Bradenton, Florida. Every two years local artists are invited to paint or decorate a gecko (they are 6-foot fiberglass forms) to be auctioned off for charity. They are mounted in various spots about town for several months before the auction; mine is shown (in happier times) on the side of the South Florida Museum where it lived last fall. Its feet are painted, but the rest is shells, glass gems, and blue/green/white tiles of various sizes. It's name is "Flotsam Gecko." Unfortunately, this spring, after the gecko was purchased at the auction, tiles started falling off! I repaired small portions twice, but last month, after it happened again, I brought it back to my studio to completely redo. This was my first time working on fiberglass. I had used exterior thin-set, which usually sticks to anything like a rock, but apparently it is not suitable for fiberglass. I'm currently in the process of completely redoing the job, having learned a valuable lesson about substrates. I'm now only using adhesives that are meant for fiberglass, so they have some flexibility. I also reinforced the form on the inside with spray foam; I think part of the problem is that the form was not completely stable and rigid, so it's more likely to crack a rigid adhesive like thin-set. Finally, I roughed up the surface with sandpaper, a wire brush, and a nail. Live and learn! Here is the complete "Four Seasons" mosaic. I won't be able to install it for a few months--the remodelers are just getting started at my client's home--but I'll take an "official" photo when I do. I met with the client's designer, Pam Holladay of Siebert Architects, to help choose the border tile. Both the client and I had thought that the border should contrast with the light travertine that will surround it, so I ordered several samples ranging from mahogany to golden brown, and, almost as an afterthought, the ginger-colored glass tile that I ended up using. I find that when I have a choice to make, the answer almost always shows itself if I just "stand back" and watch and listen, whether it's in the studio or in life. In this case, as soon as I saw this light ginger glass tile between the mosaic and the travertine sample, I knew it was the one, and so did Pam. It's almost like a taste sense when it is right. It feels satisfying and complete. It's a message of intuition, always there ready to let me know what direction to take. 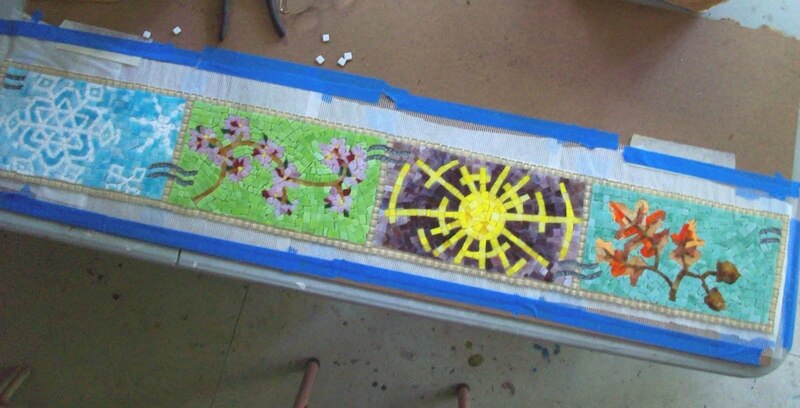 The client for this piece wanted a narrow frieze to go over a fireplace in her bedroom. The surround will be a soft beige-colored travertine. "The Four Seasons" was my client's desire, as she really loves her northern home and the change of seasons. This picture shows the work in progress. I did a detailed painting for approval, which is on the bottom. I secured a piece of parchment paper over it (I've also used plastic wrap), then fiberglass mesh onto which I glue the glass. I'm using stained glass exclusively, which is a new medium for me -- in the past I've used mostly glass tile, with maybe a few pieces of stained glass here and there. In this case, the design was so intricate that it would be too hard to cut the small pieces of tile to fit. Besides, there is such richness and subtle variations of color with stained glass, it really lends itself better to the overall design. 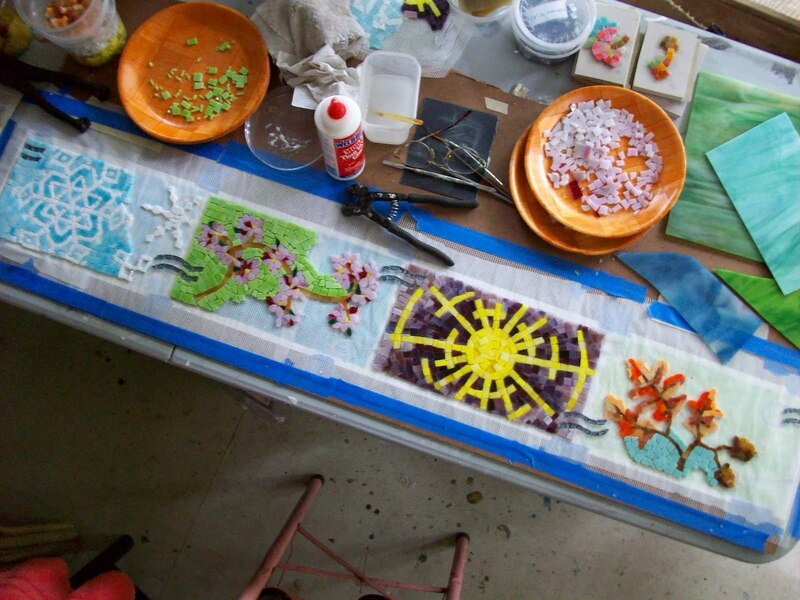 Randy LaSalle Fox, another local mosaic artist, introduced me to this beautiful medium. Today is Sunday, the cat is napping and it's too hot to work in the garden, so here I am. This is the first post for a blog about mosaic and art and anything else that I feel like writing about. My thanks to my friend Elizabeth St. Hilaire Nelson, a wonderful collage artist, who inspired me to start blogging! Her blog is called "Paper Paintings". I love her use of vibrant colors, and she creates lots of birds in her paintings, which is a subject I love as well. The pictures show a sculpture that I've just started. 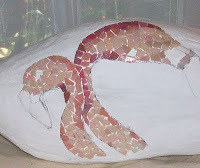 The form was given to me by another friend, Margo Barber, the founder of the Manatee Mosaic Group, which I joined a few months ago. We spend a very happy day once a month inspiring each other with our current mosaic projects at a lovely retreat center in the woods. Margo brought me this duck form after hearing me tell how I like to work on 3-D mosaics. I decided that if I were a plain duck, I'd like to be decorated with something really fancy, so I've started mosaicking flamingoes all over it. I'm using pink glass tiles in 3 or 4 shades, cut into small pieces. The picture shows a start; I'll post more as I continue working on it.